Dhaka, 13 October, Abnews: The Editors’ Council will form a human chain in front of the Jatiya Press Club on October 15, demanding amendment to nine sections of the recently passed Digital Security Act, 2018. Bhorer Kagoj editor Shyamal Dutta placed the demand in a written statement at a press conference at the Jatiya Press Club here on Saturday. Sections 8, 21, 25, 28, 29, 31, 32, 43, and 53 of the Digital Security Act must be amended appropriately to safeguard the freedom of media and freedom of speech, said the written statement. He said the Indian government had tried to pass such an act, but their High Court rejected it, terming the move as an unconstitutional one. The Council placed a seven-point demand at the press conference. Amid concerns from different quarters, the ‘Digital Security Bill, 2018' was passed in Parliament on September 19 to deal with cybercrimes, including hurting religious sentiments, negative propaganda against the Liberation War and Bangabandhu, and illegal activities in e-transactions and spreading defamatory data. 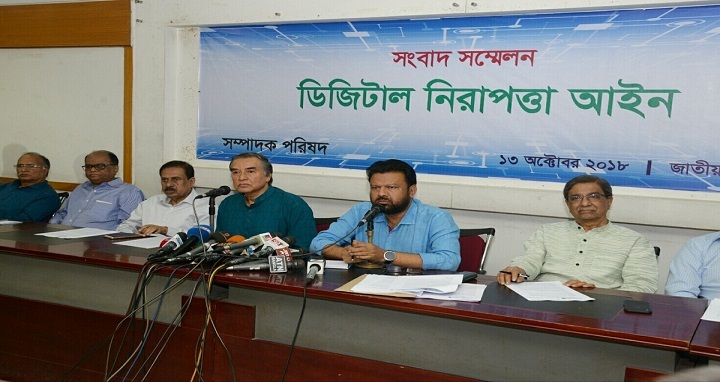 Voicing its deep regret at the passage of the Digital Security Bill 2018, which it considers to be used against the freedom guaranteed by the constitution, media freedom and freedom of speech, the Editors' Council at a meeting on September 22 decided to stage a human chain on September 29 in front of the Jatiya Press Club. Urging the Editors' Council to postpone its human-chain programme, Information Minister Hasanul Haq Inu invited the editors to sit with him and others. After a meeting with the Editors’ Council on September 30, Law Minister Anisul Huq said the Editors' Council’s objections to nine sections of the ‘Digital Security Bill’ and its demand for amending those would be placed before the Cabinet for discussions.